US demand for welding equipment and consumables will rise 6.4 percent annually through 2015. Arc and resistance welding systems will remain the dominant welding techniques. Welding electrodes and filler metal will remain the dominant consumables, while emergent products like flux-and metal-cored electrodes grow the fastest. 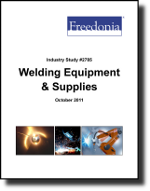 This study analyzes the $5.2 billion US welding equipment and consumables industry. It presents historical demand data for the years 2000, 2005 and 2010, and forecasts for 2015 and 2020 by welding technology, product (e.g., arc welding equipment, resistance welding, oxyfuel welding, laser beam welding, welding electrode and filler metal, shielding gases, oxyfuel gases) and market (e.g., manufacturing, construction, energy and power generation, repair and maintenance). The study also considers market environment factors, details industry structure, evaluates company market share and profiles 29 industry players, including Lincoln Electric, Illinois Tool Works and Praxair.